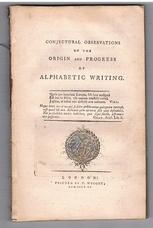 Home » Conjectural Observations on the Origin and Progress of Alphabetic Writing. Presumed first edition and published 1772 (see COPAC). 8vo., disbound, complete. ,ix,,126,p.,3 folding plates (all present), with dedication leaf. Title vignette. Coat of Arms of Sir George Beaumont to whom work is dedicated. Illustrative head-and tail-piece. The 3 plates bear alphabetic tables, and an Egyptian inscription with facing translation. ; A scarce and unusual early work on the formation of alphabets. Davy posited writing as a human invention (rather than having Divine origin, commonly thought at the time) in a way that has relevance to today's theories. Pp. 123- contain 'Conversation between Queen Elizabeth and Dr. Symson' and a 'Hymn to Isis'.